For those of us who love traditional camping, the idea of pulling out a dirty, smelly, musty (oh you get the idea) tent from your garage is not a pleasant thought. Thermo Tents could be the answer and the future of camping! 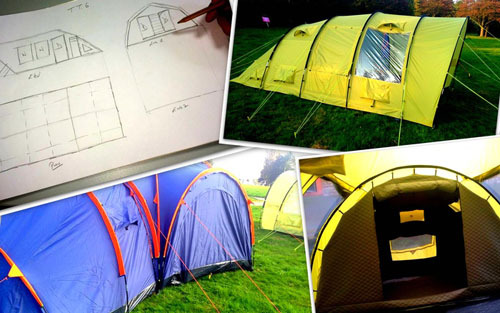 Derek O’Sullivan is an Irish native and founded Thermo Tents in 2013. The company clams to have developed the world’s very first properly insulated tent, both thermally & acoustically. Their latest product is Thermo Tent 6 and not only does it offer campers a comfortable temperature inside the tent, but it also does an excellent job of insulating from those annoying, outside noises that can sometimes ruin your camping trip. The new Thermo Tent 6 was designed utilizing cutting-edge, insulation technology made from several breathable materials, including cotton-based and poly-cotton insulation. The end result is the luxury tent provides surprising enjoyable indoor temperatures and eliminates noise from the outside. Including the porch, the external tent measures 23 feet (7 meters) long, 13 feet (4 meters) wide and 7.2 feet (2.2 meters) high. Interior wise, the tent is 7.6 feet (2.3 meters) long, 12.5 feet (3.8 meters) wide and 7 feet (2.1 meters high. The new Thermo Tent 6 from Thermo Tents is pure quality. The fully insulated sleeping quarters is split into two separate rooms – 2 berth and 4 berth. Each room has its own door. Try the world’s very first correctly insulated camping tent and to enjoy the most comfortable night’s sleep in any tent. • Groundsheet (Sewn In) – 210D Strong Oxford, 10,000mm HH. • Poles – HT Steel, 12mm. • Inner Tent – 2 layers of extra breathable Polycotton come together to sandwich our special TTinsulate insulation which boasts very low thermal conductivity and a high density. • Fire Retardant – All of our materials are FR, and exceed ISO EN 5912 (2011) standards. • Pegs – Our plastic pegs are the most durable in the marketplace and they won’t turn in windy conditions as some other cheaper products do. • Night visibility – Our pegs and guy lines are reflective and so easy to see, even in darker conditions. • Mesh – B3 standard (Top possible quality). The sleeping section from the Modular Tent from Thermo Tents can be bought as a either a standalone or three person insulated sleeping tent. • Flysheet – Poly-cotton (65%:35%) with rip-stop, 7,000mm HH on Dome. • Poly-cotton (65%:35%) with Ripstop on sleeping tent, along with 30mm TTinsulate high performance insulation. • Poles – HT Steel 12mm on dome and 9mm fibreglass on sleeping tents. • Fire Retardant – All of our materials are FR, and exceed ISO EN 5912(2011) standards. • Pegs – Our plastic pegs are the most durable in the marketplace and they won’t turn in windy conditions as some other cheaper products tend to do. • Weight – dome 35kgs, sleeping tent 11kgs. Thermo Tent Mod is the latest addition to the Thermo Tent family of tents. It has a unique design, combining the space of the large living along with the privacy of separate, insulated bedrooms. Each bedroom can sleep up to three people. This tent model has both storage compartments and pet compartments that you can zip on or off, depending on your needs. If you enjoy reading the latest travel industry news like the new Thermo Tents, then follow our luxury blog. We can also help plan and book all your luxury travel reservations.